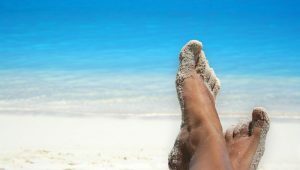 This is the time of the year when our feet tend to be frequently exposed to the elements as we wear sandals, flip-flops and are often barefoot. Limit walking barefoot as it exposes feet to sunburn, as well as plantar warts, athlete’s foot, ringworm, and other infections and also increases the risk of injury to your feet. Stay hydrated by drinking plenty of water throughout the day. This will not only help with overall health but will also minimize any foot swelling caused by the heat. Some activities at the beach, lake or river may require different types of footwear to be worn. To be prepared, always pack an extra pair of sneakers or protective water shoes. If your shoes will be getting wet, they should be dried completely before your next wearing to prevent bacteria or fungus from growing. 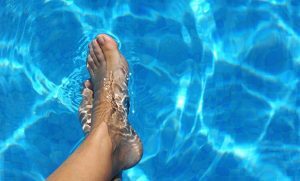 Use these Summer Foot Tips to help keep your feet safe and comfy this Summer! If you injure your foot or ankle while on an outing, call our office immediately so we can begin treating your ailment as soon as possible.